Melatonin is a naturally occurring hormone that is produced in the body and is closely involved in the natural sleep cycle. ** Because inefficient sleep can affect energy and mood, melatonin is a terrific choice if you experience occasional sleeplessness or jet lag, or if you want to improve your quality of rest. 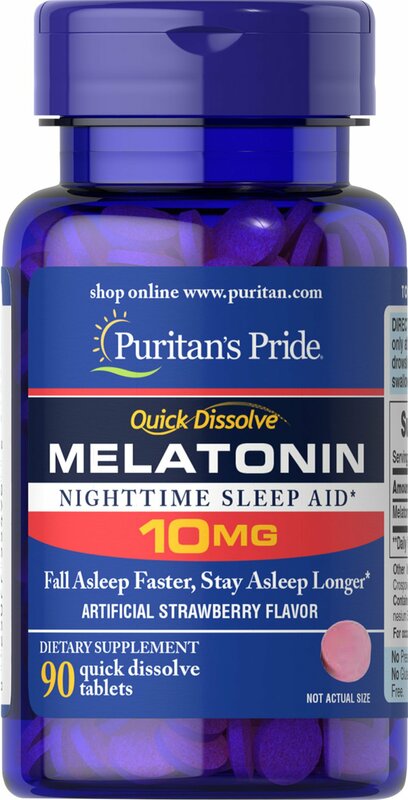 ** Melatonin helps you fall asleep faster and stay asleep longer. ** When taken at bed time, melatonin may provide blood pressure support for blood pressure already within a normal range. ** Melatonin’s effects on blood pressure may help support restful sleep and a relaxed mood. ** This quick-dissolve tablet has a pleasant strawberry taste and delivers 10mg of melatonin. No Preservatives, No Milk, No Lactose, No Soy, No Gluten, No Wheat, No Yeast, No Fish. Sodium Free.